Chromecast has been a fantastic seller for Google, with the company pushing 17 million units since release, and the Cast button being pressed 1.5 billion times. As it has grown older, we have always stated that it only gets better, and with the release of new APIs for developers at this year’s Google I/O, that little dongle is becoming even sweeter. Released as beta, Google introduced the Cast Remote Display APIs, allowing developers to create a second-screen experience for select applications, such as games, without the need for mirroring displays. 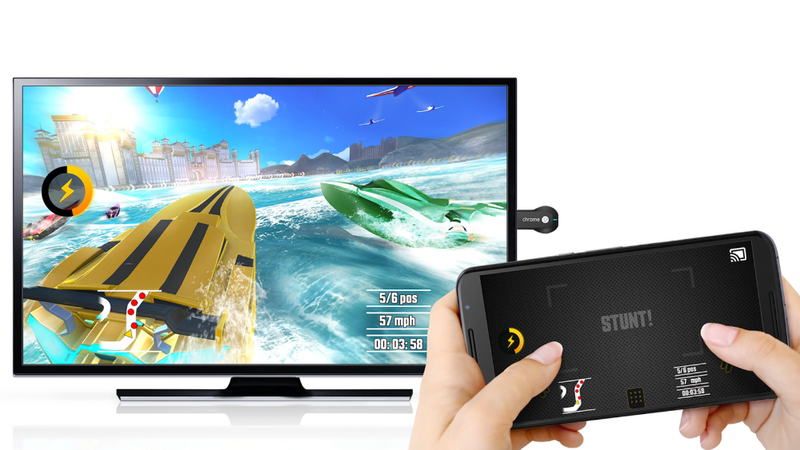 As an example, which is shown in the header image above, you can be playing a racing game on your HDTV, with the smartphone turned into a full-blown racing controller. In addition, the Game Manager APIs for Google Cast have been launched, allowing developers to build better multiplayer apps for the platform. This will lead to possibly more intense boardgames or action games built for more than one player. Seriously, if you have yet to pick up a Chromecast or Cast compatible device, do it.